Word has been received from Ned Denlinger, coordinator for the Tri-State District, of the death of Dan Grabill, pictured here several years ago at Grace College and Seminary Homecoming. 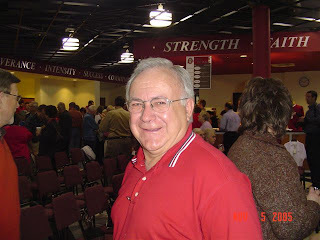 Dan, a 1959 graduate of Grace College, was well-known throughout the Fellowship for his musical skills and for his ministry in Christian school administration and as a pastor. Most recently he had been interim pastor of the Grace Brethren Church of Brookville, Ohio. He was diagnosed with lymphoma in January of 2007 and has been battling the disease since that time. Service details and complete obituary are to follow. December of 2006 I was diagnosed with Non-Hodgkin’s lymphoma which was present in my groin, bone marrow and lungs. After six rounds of chemo and 5 weeks of radiation I was in remission, I thought. The summer months were spent recuperating awaiting a CT scan in October which would document that I was cancer free. A couple weeks before that scan I began experiencing chest pain and shortness of breath. The scan revealed a tumor on my lungs. The biopsy documented that I had a new kind of lymphoma, Burkitt’s. This cancer, unlike the previous, was very aggressive and life threatening. Only 30% survive. Three powerful chemo treatments were started immediately. My oncologist recommended a stem cell transplant as the only way to possibly stop this from reoccurring. I was approved for this procedure. This will be occurring in Indianapolis the first week of April. The transplant will be my own cells which they have frozen now. In the meantime I have been going through two more rounds of a Chemo, that is very effective on Burkitts and provides a shield around my brain in case this cancer returns. There is a 70% chance that it will return regardless of the treatments. Now as to what the Lord has been sharing with me. 1. The above prognostications are the best estimations of man. His timetable for me could be completely different. 2. I have been following the advice of those whom God has placed in my life for treatment, but my ultimate confidence is in the Lord. How more secure could anyone be than that? 3. During one of my chemo treatments I went through a Isaiah 6 experience. God allowed me to see how my sins look in His sight. I was shaken and, like Isaiah felt “I am lost”, it’s over for me. It was then that Jesus shared that His blood covered that sin and because of grace I stand redeemed in His presence. I will never forget this experience. 4. While I believe that my earthly ministry is not over I have come to some conclusions similar to the Apostle Paul as stated in Philippians. If I get to stay here and serve the Lord, I win , but if God takes me home via the cancer route, I also win. What could compare with going to heaven and being with Jesus forever? So, I can’t lose and therefore I confidently face whatever is in my future. 5. The preciousness of friends who have stood with me in prayer has been overwhelming. So many encouraging notes and acts of kindness. I am humbled by their concern and commitment. Serving with Dan Grabill was a great privilege. I will be forever grateful to the Lord for his impact on my life. Just an FYI, Dan's family has a website available at www.caringbridge.org/visit/dangrabill that will give more details and also will allow visitors to leave comments for Dan's family. We thank God for allowing us to meet and serve with such a godly man as Dan Grabill.